Bon Jour! 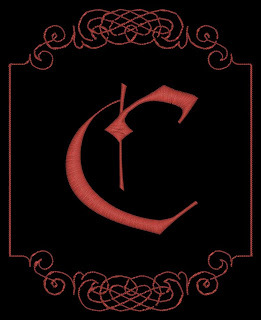 Welcome to Cajun Stitchery’s weekly email and welcome to our family. Don’t forget to visit us at www.cajunstitchery.com, www.flickr.com/photos/cajunstitchery, and, www.cajunstitchery.etsy.com often. We are also on Twitter and Facebook. Happy Easter or Joyeuses Pâques. This week was pucker week. 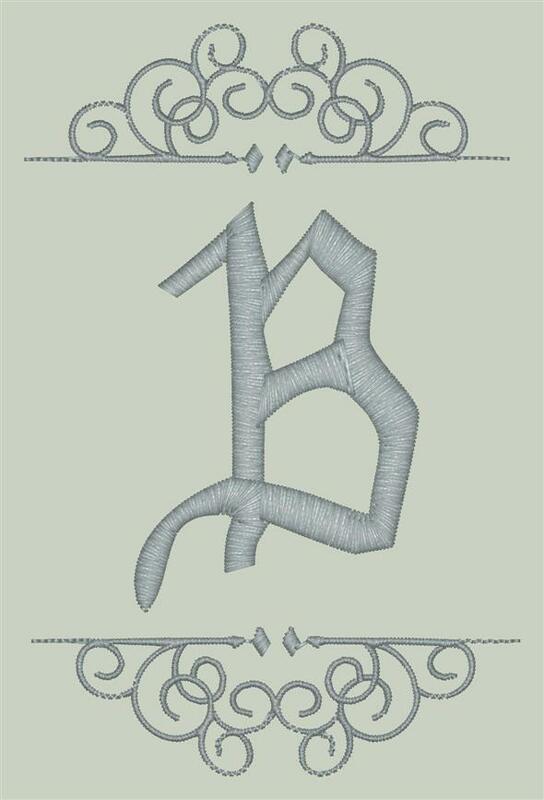 I had to embroider a 10 inch tall letter G in fill stitches. 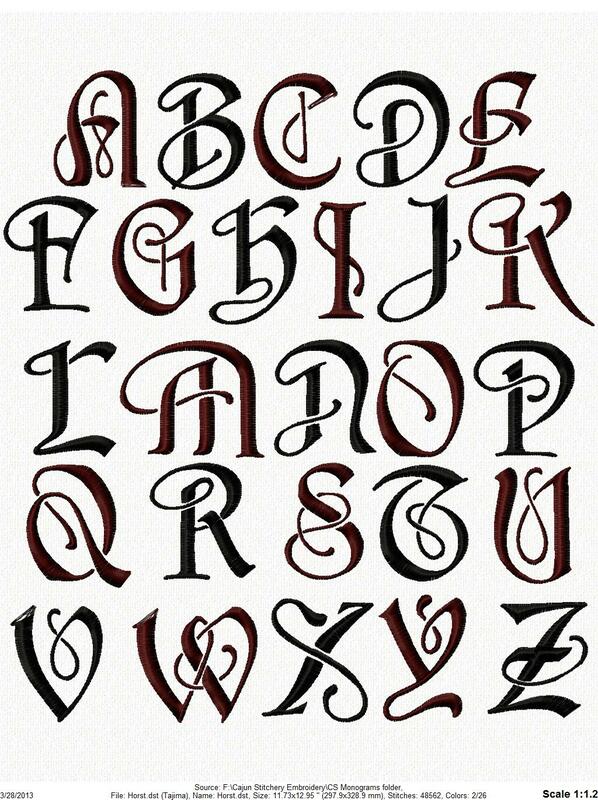 That letter curled and puckered all over the place. It was a definite fight to the end but I ended up using 5 layers of heavy stabilizer. That worked except for a few issues. 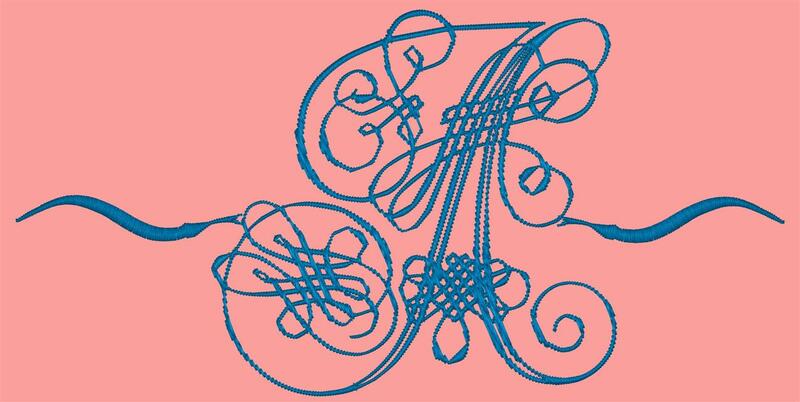 The sheeting on which the G was embroidered buckled at the gap between the point of the letter at the top and the horizontal bar of the letter at the bottom. It was a battle royale for sure. I think we finally have a G that we can use and the G should be stitched out tomorrow. A friend is visiting Pensacola from Pennsylvania and we turned last week at Cajun Stitchery into Sesame Street. He would come in the morning and ask, “What is the letter of the day?” I would reply, “G.” Or whatever letter I happened to be embroidering that day. Every year George and I color Easter eggs. We love doing this. Yesterday morning I read on Yahoo that most people boil eggs improperly. The article proceeded to state how an egg should be boiled to eliminate that grey area around the yoke. The article said that you start with the eggs in a pot and pour cold water over the eggs. Completely submerge the eggs and do not overcrowd the eggs. Then you let the water come to a boil but not boil. At this point you turn off the stove, cover the pot with a tight fitting lid and let it sit for 10-11 minutes. Then put them in cold water or even ice. Voila! Boiled eggs. Just about every Easter we spend with one of our friends in Gulf Breeze. This year was no different. We always bring the Easter eggs. This year we brought 31 boiled and beautifully colored eggs. Each year we hide the eggs in and around her home and the hunt is on for eggs. This year we told our hostess that the egg with the X on the bottom was raw. Well, George put an X on about 15 of the eggs. All of them were cooked, of course. We hid the eggs in her front yard as we were going to her door when we first arrived. We hid more in her house and then outside in the back yard. Her sweet little dog was having a wonderful time finding the Easter eggs and I think ate one or two of them. They were finally collecting eggs from the dog and putting them where the dog couldn’t get them or throwing the eggs over the fence in the back yard. They certainly lost count of the eggs and by the time we left, there were lots of unfound eggs remaining. It is a shame that as we age our memories start to fail a bit. I would be glad to tell her where the eggs are located if I could just remember. We did have a wonderful time at our friends’ home for Easter. Luckily for all of us, our hostess can cook. She cooked standing ribs with all of the side dishes and dessert. It was absolutely delicious. If you are not a subscriber and would like to receive Cajun Corner weekly, please email cajunstitchery@yahoo.com and let me know to put you on our email list. No time to read Cajun Corner? Visit our blog at www.cajunstitchery.blogspot.com and click the Odiogo button to hear the computer read the blog. I was going to include an article on the origin of April Fools Day but my research has resulted that no one really knows the origin. There are several conjectures but no one really knows. A day of foolishness and pranks is celebrated in Europe, as well as the Americas. Even Snopes says it is undetermined. So, enjoy the day and let something remain a mystery in life. P.S. You are always welcome to stop by and look at all of the catalogs and pass some time with me, cher. Late again. My only excuse is that it was a busy weekend. A dear friend from Huntsville visited the beach for her birthday and the girls threw her a birthday party Friday night. We had so much fun and literally laughed until we cried. I got home around midnight. Saturday I visited a friend in Navarre at her hair salon. That was a long drive in the rain but well worth it. She and her staff at Studio 98 Hair Design are so much fun. I always have a ball when I go out there. I did get some work done on Saturday but not a whole lot. Saturday night another friend of mine and I began messaging on Facebook. She is such a close friend that we consider her part of the family but we never get to see each other until we meet a funerals. We have a funeral to attend on Tuesday, thus began our conversation. It seemed like we messaged for hours and it was delightful. Sunday I worked on orders that needed to get out Monday. A friend on Facebook messaged me that she is getting married on March 30th and needed some embroidery done. We met and the embroidery was done and delivered. She contacted me this past Thursday saying she needs another handkerchief but asked if I’d mail it to her because she can’t get over here. We mailed it to her this morning. In fact, it was an easy order because she paid via PayPal. That girl has done her wedding completely DIY. 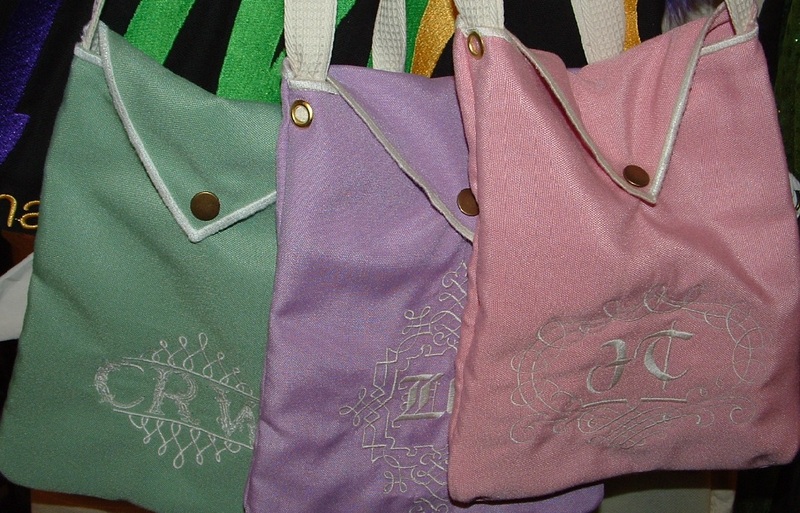 The shirt sleeve with the groomsmen’s names embroidered on the cuff for her to make wine bags is such an adorable idea. The big project of the weekend was bowling shirts. Why didn’t George do these on Boudreaux? There is an explanation. The design was about 11” by 11” and Boudreaux does not have hoops that big. Plus there was gold metallic thread involved and, at least at this time, George doesn’t use metallic thread. George informed me today that he is going to move Clothilde to the house next door in the next couple of days. When he does move her, I have to give him one whole day of not embroidering with her. I’m so excited to have her next door and really start getting the business set up there. This plan is starting to take shape. We’ve all heard the term ‘vernal equinox’. Vernal means ‘spring’ and equinox means ‘equal night’. Both words are from Latin. Despite the term, the day when there are 12 equal hours of daylight and darkness usually happens before the first day of spring. The first day of spring in the southern hemisphere is the date of the autumnal equinox in the northern hemisphere, usually in September. Benjamin Franklin was the first American to propose Daylight Saving Time in 1784. However, it wasn’t fully implemented in the US until after the Second World War. The practice of starting Daylight Saving Time on the second Sunday in March in the US started in 2005. Daylight Saving Time starts and ends at different times around the world. In Europe, Daylight Saving Time is known as Summer Time. The reason that there’s more daylight during spring is that the earth’s axis tilts towards the sun at this time of year. Some of the plants that have strong associations with spring include dandelions, daffodils, lilies, primroses, hyacinths, tulips, azaleas, iris and lilacs. Several singers have sung about spring including Van Morrison (Celtic Spring), Billie Holiday (Some Other Spring) and Frank Sinatra (Suddenly it’s Spring). Animals and insects associated with spring include the rabbit, frog, deer, fox, bear, bee, butterfly, ladybug and hummingbird. Spring fever is not just a myth – the body may experience physiological changes due to changes in diet, hormone production and temperature. Melting snow and additional rain may cause more flooding in spring. Children grow faster in spring. Spring is when birds return home after migrating in winter. About 1800 bird species migrate. There is not a whole lot to report this week. Most of the week has been spent getting a customer ready to go to Texas. 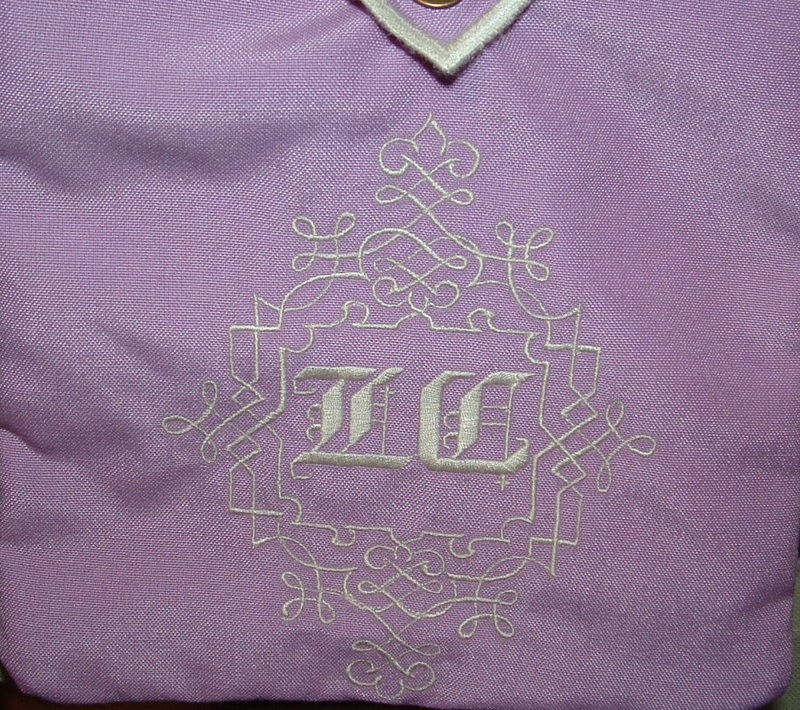 A lady on Facebook did contact me to do some embroidery for her wedding. She wants the groomsmen’s’ names embroidered on the cuffs of sleeves. She is using the sleeves as gift bags. How cute is that? 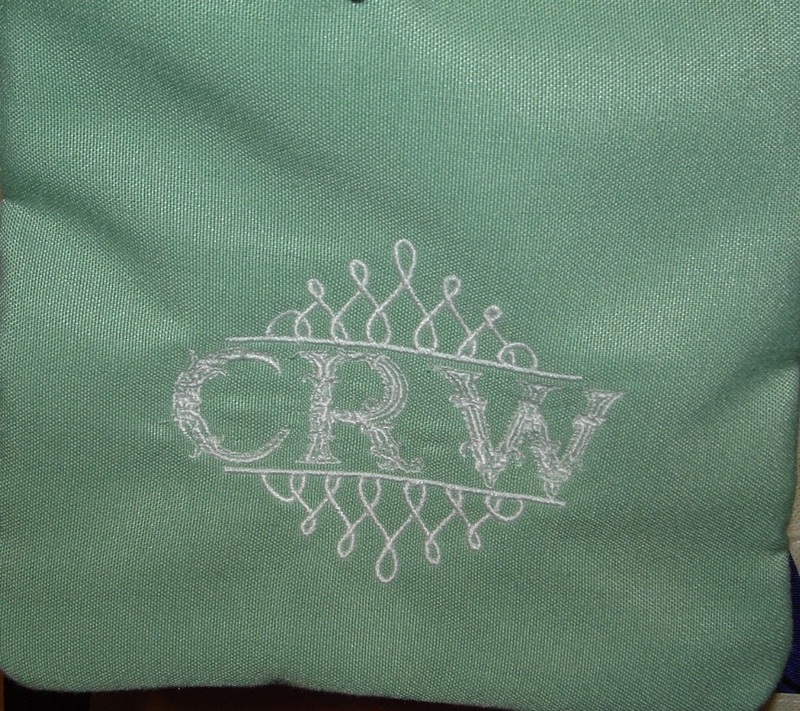 We will also be embroidering handkerchiefs for the girls. I’ll meet with her on Monday morning. This should be a fun project. It turned out a good thing that we didn’t begin working on the bowling shirts. The lovely bowling ladies changed their minds about the design and colors. Now I’m waiting on a final decision. The peas have sprouted in the garden but not a lot of other things sprouted. We should have at least 30 sugar snap pea plants growing out there. Yummy. Today has been such a lovely spring day. All I want to do it get out in the garden. Maybe tomorrow will be garden day. The dogs are enjoying the weather as well and are staying outside more than usual. The cats, of course, don’t care one way or the other. They are in their own royal world. A friend of mine bought a cute little house on the beach with the intent of renting it. When it is not being rented, she planned to spend some time there. Before the closing on the house was final she had renters signed up through June. She may not get to stay there at all, at this rate. That was a really good investment. My mama worked until she was 90 years old. She, of course, had a career as a legal secretary until she retired. Then she and daddy bought some quadraplexes in New Iberia and she managed that property until she was 90. She prepared her own tax returns; maintained the property; and was the landlady extraordinaire. She loved to play games and have activities that made her mind work. I guess someone told her the mind was the first to go. I am my mother’s daughter because I have no intention to ever stop working. Cajun Stitchery is my retirement job. It certainly isn’t as stressful as my career jobs were. I sure hope that Cajun Stitchery lasts until I’m 90 or more. Sitting on a rocking chair, rocking my life away is not a pleasant thought for me. George’s father will be 90 this year and is still going strong. We were concerned about him after Mom passed away earlier this year but he seems to be hanging in there and bidding his time. George talks to him at least three times a week now. A few days ago I received a delightful surprise phone call. It was my son, Hank, calling to let me talk to my great granddaughter, Kayla. I know that everyone heard her say, “Ba, ba ma, ba…” I heard her say, “Hello, great grandmother, it is such a pleasure to talk with you.” They thought she was biting and drooling on the phone but I know she was blowing kisses to me because I received each one of them. for possible replacement of the Pope? the top man for the job. I do not know that much about him. Our customer saw pictures of her towels and just loved them. Since she lives out of town there was an issue of getting the towels to her. The whole transaction took on a humorous turn. Her significant other was coming to Pensacola for a few days. They also have a home on Pensacola Beach. It was decided that the towels would be delivered to a mutual friend, since I was meeting her anyway. The mutual friend paid me and took the towels to the significant other to take to the customer. The towel order seemed to turn into a covert operation. Once the delivery was made to our mutual friend, I sent an email: “The package has been delivered.” I’m still chuckling about the whole thing. The birthday purses were received well. They were fun to make. It is just finding the time that is the issue. The new monograms/fonts are beautiful and some more were stitched out this week. Last Wednesday Cajun Stitchery celebrated its 4th anniversary. Yippee!!! Cajun Stitchery has made a lot of friends along the way. And we are grateful for each and every one of them. People call, email, or walk in the door as customers and leave as friends. That is the Cajun way but I certainly hope that says something for our quality of work and our customer service. A few weeks ago a couple of ladies came by to place an order for bowling shirts. The ladies were friends of mine before the order. I happened to be baking bread in my bread maker at the time. 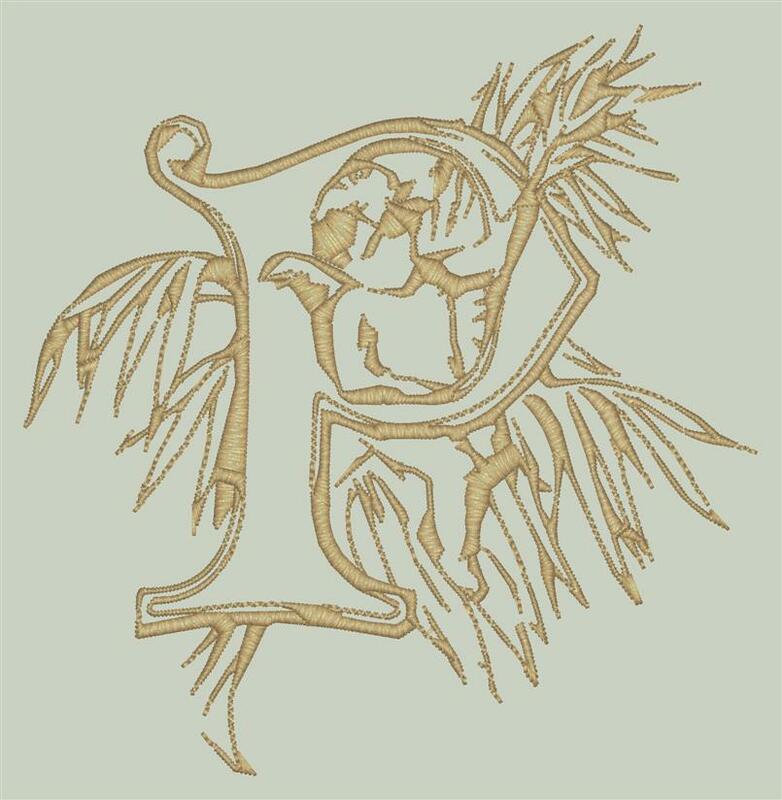 As we talked and discussed the embroidery design the aroma of the bread baking filled the room. One of the ladies told me that I should have bread baking whenever I have customers over. I could get the reputation of “get your embroidery done at Cajun Stitchery and get to sample her fresh baked bread.” She says that customers would order from me just for the breanniad. Well, I certainly hope that’s not why people order from Cajun Stitchery. I would rather it be the quality of the product and the customer service, but if I am baking bread you are certainly welcome to some of it. We have so many embroidery designs that I still haven’t gone through all of them. While perusing the designs, I noticed a complete directory on projects. Someday when I have the time, those projects are going to be created in our studio. One design is for tassels that, among other things, can hang from the ceiling fans to turn them on and off. That would be so cute for decorating the house next door. All I need is time. Yesterday was a quiet day around the house. The weather was beautiful and, of course, I had to play in my garden a little. Many of the peas that we planted two weeks ago have sprouted now. Aspirin and dish washing soap were mixed and applied to many of the plants to help them grow. Of course, there was the usual trimming and maintenance. We did harvest some ginger. Now we have to figure out how to use it in our cooking. For dinner I was in charge of the salad. I cut a head of romaine lettuce from the garden. Then I made a pesto with lots of herbs from the garden, parsley, thyme, garlic, onion, rosemary, and oregano. You can honestly taste the freshness. Believe it or not, the following announcements actually appeared in various church bulletins. Don't let worry kill you -- let the church help. Thursday night - Potluck supper. Prayer and medication to follow. Remember in prayer the many who are sick of our church and community. The rosebud on the alter this morning is to announce the birth of David Alan Belzer, the sin of Rev. and Mrs. Julius Belzer. This afternoon there will be a meeting in the South and North ends of the church. Children will be baptized at both ends. Tuesday at 4:00 PM there will be an ice cream social. All ladies giving milk will please come early. Wednesday the ladies liturgy will meet. Mrs. Johnson will sing "Put me in my little bed" accompanied by the pastor. Thursday at 5:00 PM there will be a meeting of the Little Mothers Club. All ladies wishing to be "Little Mothers" will meet with the Pastor in his study. This being Easter Sunday, we will ask Mrs. Lewis to come foreward and lay an egg on the alter. The service will close with "Little Drops of Water." One of the ladies will start quietly and the rest of the congregation will join in. Next Sunday a special collection will be taken to defray the cost of the new carpet. All those wishing to do something on the new carpet will come foreward and do so. The ladies of the church have cast off clothing of every kind. They can be seen in the church basement Saturday. At the evening service tonight, the sermon topic will be "What is Hell?" Come early and listen to our choir practice. Our customer loved the ball caps; however, we forgot to take pictures. Luckily, we took some pictures when we were working on the design in the beginning but it would have been nice to have a photo or two of all 65 ball caps. Now we are working on a towel order. The customer wants a peace sign, mermaid, and fish embroidered in all white on her bath towels, wash cloths, and hand towels. George is working on this order, too. He is quite the little embroiderer. The designs worked out well except for the little fish that the customer requested. 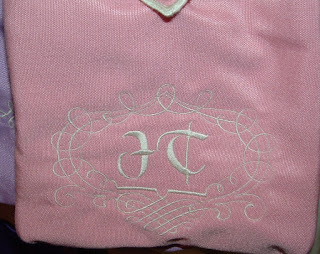 The fish is an outline type design and the lines were so thin that the loops in the fabric covered the outline. The design had to be altered to thicken the lines. They are working fine now. 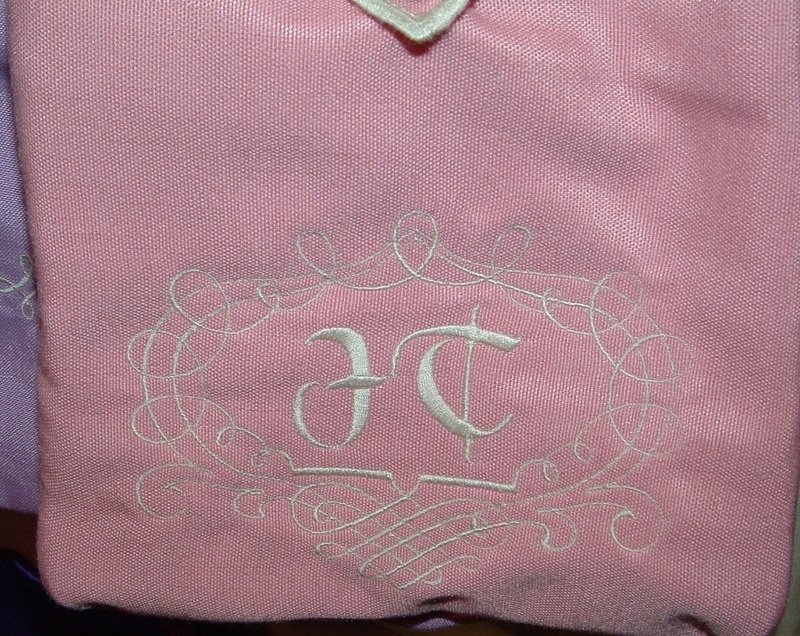 To hold the loops in the terrycloth down to embroider, a special overlay stabilizer is required. The stabilizer is basically starch made into sheets. Once the embroidery is done and the tearaway stabilizer is removed from the back, the towels need to be washed to remove the stabilizer on top. Recently in one of the embroidery periodicals that I read there was an article on this suggesting using a thin plastic, rather than the water soluble overlay. That would not work in this situation because of the outlining in the designs. It would work nicely on fill or appliqué designs. What have I been doing? Mardi Gras put me terribly behind on all of my birthday gifts for the girls. I have everything to make the gifts but there are a few steps to the project and all I can say is that I’m working on it in my spare time. In the meantime, I’m combining a couple of projects. 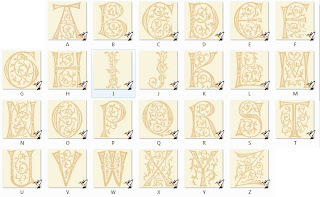 When I use my Embird digitizing program to download true type fonts, they usually look great on the computer screen. That does not mean they will stitch out okay. 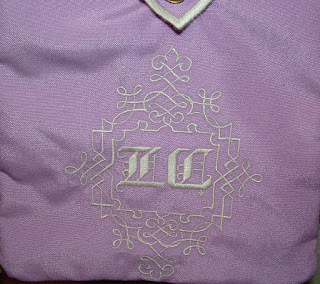 In fact, when I send anyone a “computer simulation” of a design, any design, that is exactly what it is, a computer rendition of the embroidery design. 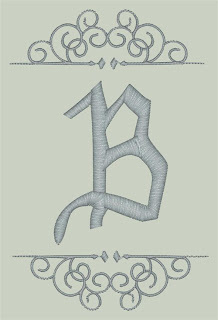 A computer screen does not have depth or drape or any of the issues involved in hooping and stitching. The computer simulation could stitch out horribly or beautifully. You just never know until you stitch it out. 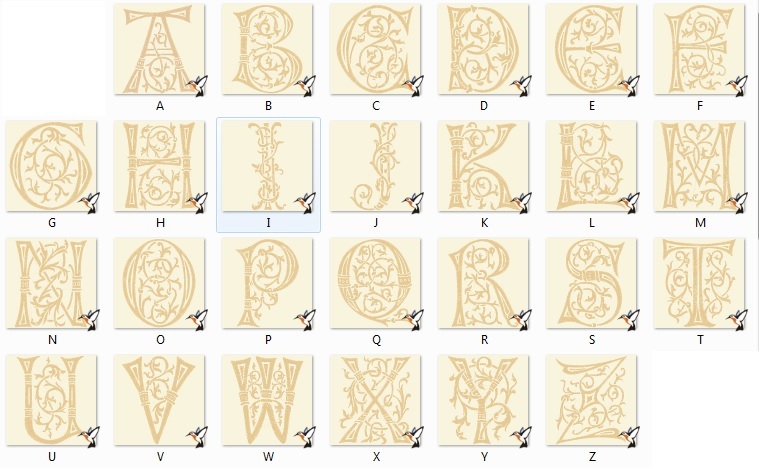 Nevertheless, I have recently downloaded a whole bunch of true type fonts. They are more in thee area of antique, heirloom type fonts. It takes awhile to create one of the samplers, so I decided to make little in-the-hoop purses with the girls’ initials in some of the new fonts. 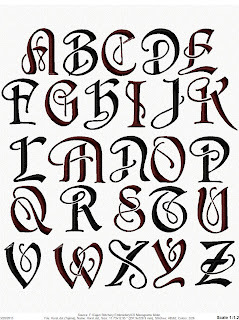 In addition to that, there are fonts called ornaments and wingdings. 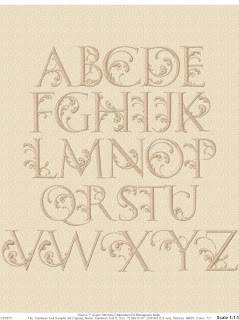 If it is a true type font, I should be able to change it into embroidery stitches. 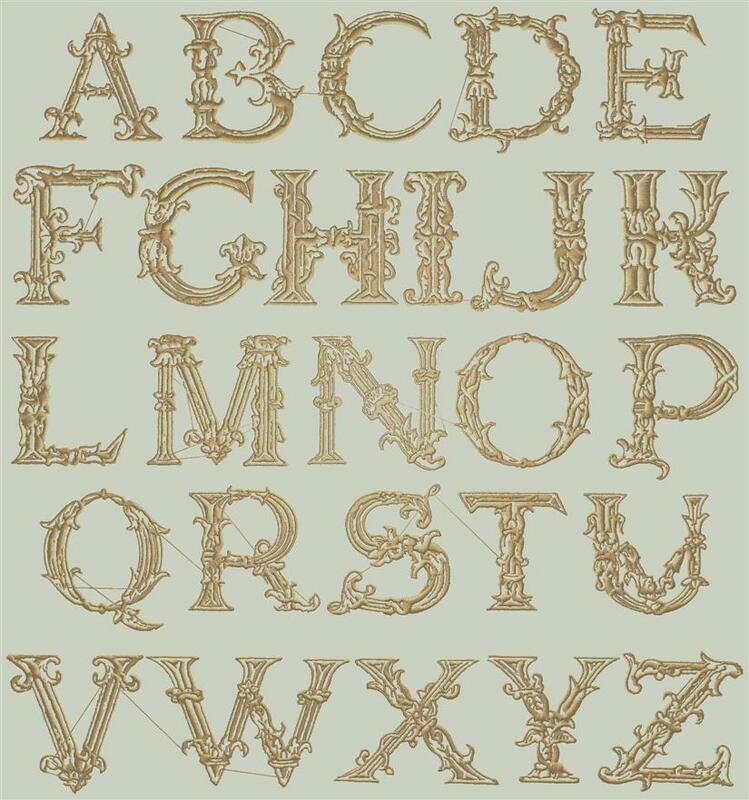 Some of the ornaments that were downloaded are beautiful curly cues and swirls to enhance the monogram. 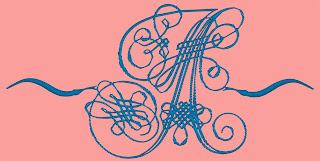 I am using some of these around the monograms on the little purses to see how they look and stitch out. One that I did actually stitched out pretty nice but the columns were so thin that it kept breaking the thread. 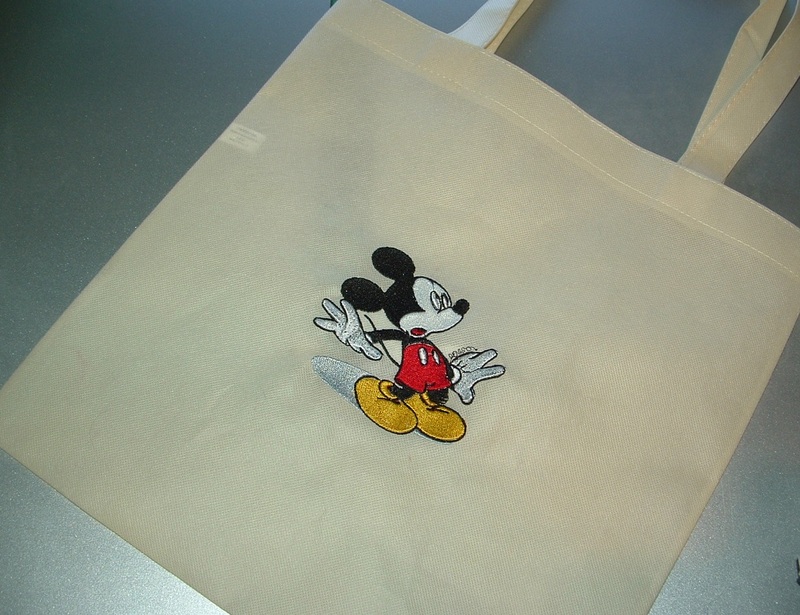 Remember: not everything done with pen and ink can be duplicated in embroidery. 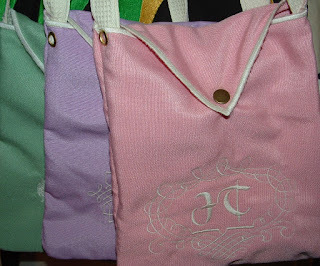 The purses themselves are a design that I created. The entire purse is made in-the-hoop. Once the purse is taken out of the embroidery hoop, the only thing left to do is attaching the handle/strap with grommets and attaching the snap. It is a really awesome process and we can make these purses up to 10” square. Now that the house next door a/k/a the green house is remodeled, we are working out decorating ideas. Our garage still has Mama’s apartment furnishings in it. I never had any place to put her stuff, nor did I have the heart to go through it. Now is the time. The house is going to be a multi-purpose house with Cajun Stitchery occupying a portion. So, it will be a semi-business, semi-home thing. It needs to be available for my Nereid girls to meet and spend the night, so, beds are going to be important. There are a lot of beds, tables, ottomans, chairs, drawers, etc., that George is going to have to make for me if I cannot find what I want in Mama’s apartment, or at the Salvation Army or Waterfront Mission. In addition to the furniture, there are 20 windows that need curtains and I will make those. There are rugs, towels, etc., needed. All sorts of things that I need to buy or make and, of course, embroider. If you are local and want to get rid of tee shirts, send them over. It doesn’t matter if they are ripped or stained. I plan to make some rag rugs out of them. We have had a few cold days lately, down into the low 30’s. Today is like Spring and absolutely beautiful. None of our newly planted seeds have sprouted yet. That’s probably a good thing since the sprouts would have been injured by the cold. 66% of home based businesses are owned by women. Insulating your attic reduces the amount of energy loss in most houses by up to 20%. Recycling one glass jar, saves enough energy to watch T.V for 3 hours! Rubber is one of the ingredients in bubble gum. Salmon can jump as high as 6 feet. Snails breathe through their feet. Sound at the right vibration can bore holes through a solid object. Sound travels fifteen times faster through steel than through air. Surgeons who listen to music during operations perform better than those who don't . The American Film Institute has named composer John Williams score for Star Wars as the greatest film score of all time. The average American/Canadian drinks about 600 sodas a year! The average four year-old child asks over four hundred questions a day. The banana tree cannot reproduce itself. It can be propagated only by the hand of man. The Bible is the most-shoplifted book in the world.